Back last August I received an email from Martin Wurst telling me about the book Zombies in Love (written by Nora Fleischer) that he had narrated in audiobook form. I listened to half of it, enjoyed it then somehow completely forgot it existed until a week or so back when I rediscovered it. Like the living dead I may be very slow at doing things, but I never give up (that analogy sounded better in my head). It wont really be a surprise but Zombies in Love is not a horror in the usual sense, it has more of a goofball humorous outlook that is reflected both in the characters and the plot itself. Jack as the undead ex-reporter is a likable main lead, he is very flawed as a character but is self aware so that is never a problem. Lisa is also not that bad a character though she has less proper back story than Jack. It is interesting that despite having been murdered Jack is not seeking revenge on the killer but sees his new life as a way to re-do his life. For Jack the main antagonist for his sub plot wasn't a memorable character, I never feared or hated him rather he felt inconsequential. Winthrop University is the real star due to it having so much history layered on it. In the book the Uni is a weird place, one where there are rumours of students being turned into gargoyles and bricks, where the Boston police are in their pocket and where there of real hints of supernatural goings on. One description that mentions the Uni was in existence even before the land was settled by new Americans gave an almost H.P Lovecraft sense of mystique as does the hoofed creature that is rumoured to slumber in the basement. The zombies of this story are supernaturally reanimated, as such they are pretty much invincible with even shots to the brain not able to kill them (instead causing a migraine and the occasional ejection of bullet fragments). The zombies need to eat human flesh to retain their intelligence, soon devolving into traditional undead should they not eat. They are sane enough that they have zombie support group meetings at the local cemetery as well as hold mostly rational conversations with their pursuers. While this isn't a horror there is plenty of action with plenty of people being killed by the walking corpses, but only characters who actually deserve it. The six hour long audiobook is narrated by Martin Wurst in what was his first narration, though you wouldn't know it by the clear and interesting way he reads the book, the voice for Jack is spot on and he never seems un-natural in anything he narrates, even sound effects are spot on (in keeping with the goofy dry humour), I guess if I had any complaints it would be that Lisa sounded a little too meek for what is a headstrong woman. His best character voice was Arturo; the leader of the zombies, it really conjured up an image of what this person looked like every time he said anything. Initially I found the plot to not be that exciting, but it soon ramps up, it was interesting to get the perspective of the two grad students so much, their reasons for trying to clear up the mess was pretty funny (trying to appease their lecturer so he would pass them), and the whole last third while predictable enough is still exciting, though I admit to getting a bit confused with it seeming to end too swiftly, the ending popped up out of nowhere when I thought the good vs bad story was still in full swing. Overall as a book Zombies in Love is not bad, as always audiobooks really seem to enhance the original work and that is the case here with a narrator who I could (and did) listen to for hours without getting bored. 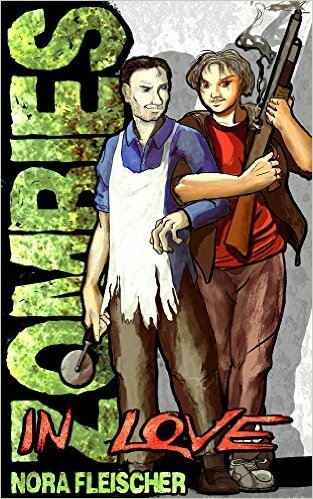 You wont find horror here but you will find an entertaining zombie yarn that is different to the usual type, don't be put off by the awful cover art.